P.R.A.Y. • Run Hard. Rest Well. This promise speaks to me of prayer. The acronym P.R.A.Y. is a helpful tool for me as I explore ways to find rest for my soul. A momentary halt. Even though my intentional time with God happens early in the morning, my mind is already racing, running full steam ahead. Stillness involves a quieted heart. The word “pause” helps me acknowledge the holy reverence of coming before the Throne of the mighty, creative, passionate God of all the universe. I pause, recognizing his presence. Then I dig into God’s Word. I have a passionate hunger for the words of God. I want to be equally passionate about yielding to his way, his plans, his purposes. It is a lifelong journey. In regard to Bible study, someone once challenged me to “Go slow. Live it. Pray it through.” Too often in my zeal I read too much. There is power in one, long, slow sip. When I do that, his Word is more inclined to sink deeply into my soul and not run off a hardened heart. First question. Is my ability to find rest for my soul linked to the time I take to P. R. A. Y.? Psalm 46:10 is a favorite, but we must take the time to read the whole verse, the whole psalm. Too often we stop short. Second question. Is the exaltation of God in my life, through my life linked to my ability to be still, and know? Hard questions! I’m finding more and more often that there are times when the storm clouds are so black, so full in my face, I can’t seem to get to the place with God of face to Face. I’m blindsided….blinded by the clouds. 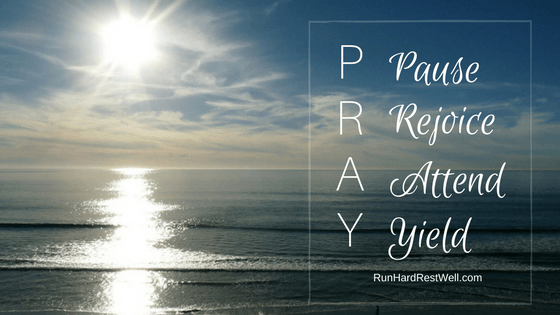 When those times come, I must….must….must, get others to pray. Soon the clouds part and I can then think, pray, ruminate over the things of God….Who He is….His Word….His promises. A moment, a day, an hour…..a nap…..whatever it takes, but is faithful to meet me in the storm and bring me to His throne. There….ah, there….there there are no storm clouds and only the shining Light of Love comes through. There…in that place…I can release my burden and surrender my will to Him. There I find the peace in the midst, but it’s a God thing. It not something I can do on my own. Thank you for the reminder to PRAY. More than once in my life I’ve asked Jesus to stand up in the boat when the waves are high and the wind is constant!